The aim of this study was to investigate the correlation between autonomic dysfunction in multiple sclerosis (MS) and brainstem dysfunction evaluated with the vestibular evoked myogenic potentials (VEMP) score and conventional MRI. Forty-five patients with the diagnosis of clinically isolated syndrome (CIS) suggestive of MS were enrolled. VEMP, heart rate, and blood pressure responses to the Valsalva maneuver, heart rate response to deep breathing, and pain provoked head-up tilt table test, as well as brain and spinal cord MRI were performed. There was no difference in the VEMP score between patients with and without signs of sympathetic or parasympathetic dysfunction. However, patients with syncope had significantly lower VEMP score compared to patients without syncope (p < 0.01). Patients with orthostatic hypotension (OH) showed a trend of higher VEMP score compared to patients without OH (p = 0.06). There was no difference in the presence of lesions in the brainstem or cervical spinal cord between patients with or without any of the studied autonomic parameters. The model consisting of a VEMP score of ≤ 5 and normal MRI of the midbrain and cervical spinal cord has sensitivity and specificity of 83% for the possibility that the patient with MS can develop syncope. Pathophysiological mechanisms underlying functional and structural disorders of autonomic nervous system in MS differ significantly. 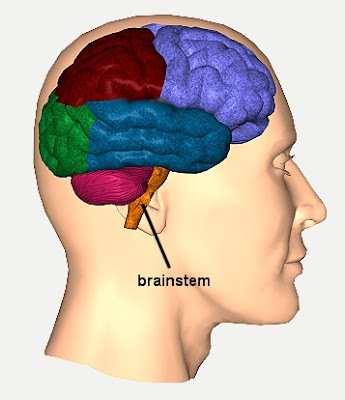 While preserved brainstem function is needed for development of syncope, structural disorders like OH could be associated with brainstem dysfunction.